Abstract. In spite of significant progress in paleoclimate reconstructions and modelling of different aspects of the past glacial cycles, the mechanisms which transform regional and seasonal variations in solar insolation into long-term and global-scale glacial–interglacial cycles are still not fully understood – in particular, in relation to CO2 variability. Here using the Earth system model of intermediate complexity CLIMBER-2 we performed simulations of the co-evolution of climate, ice sheets, and carbon cycle over the last 400000 years using the orbital forcing as the only external forcing. 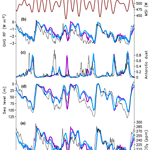 The model simulates temporal dynamics of CO2, global ice volume, and other climate system characteristics in good agreement with paleoclimate reconstructions. These results provide strong support for the idea that long and strongly asymmetric glacial cycles of the late Quaternary represent a direct but strongly nonlinear response of the Northern Hemisphere ice sheets to orbital forcing. This response is strongly amplified and globalised by the carbon cycle feedbacks. Using simulations performed with the model in different configurations, we also analyse the role of individual processes and sensitivity to the choice of model parameters. 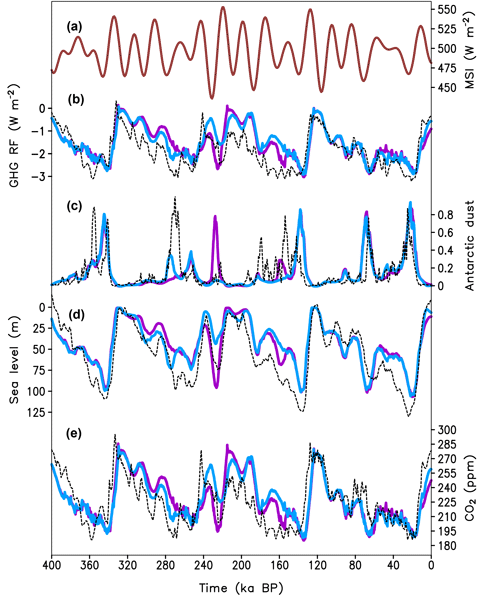 While many features of simulated glacial cycles are rather robust, some details of CO2 evolution, especially during glacial terminations, are sensitive to the choice of model parameters. Specifically, we found two major regimes of CO2 changes during terminations: in the first one, when the recovery of the Atlantic meridional overturning circulation (AMOC) occurs only at the end of the termination, a pronounced overshoot in CO2 concentration occurs at the beginning of the interglacial and CO2 remains almost constant during the interglacial or even declines towards the end, resembling Eemian CO2 dynamics. However, if the recovery of the AMOC occurs in the middle of the glacial termination, CO2 concentration continues to rise during the interglacial, similar to the Holocene. We also discuss the potential contribution of the brine rejection mechanism for the CO2 and carbon isotopes in the atmosphere and the ocean during the past glacial termination. How to cite: Ganopolski, A. and Brovkin, V.: Simulation of climate, ice sheets and CO2 evolution during the last four glacial cycles with an Earth system model of intermediate complexity, Clim. Past, 13, 1695-1716, https://doi.org/10.5194/cp-13-1695-2017, 2017. Ice cores reveal that atmospheric CO2 concentration varied synchronously with the global ice volume. Explaining the mechanism of glacial–interglacial variations of atmospheric CO2 concentrations and the link between CO2 and ice sheets evolution still remains a challenge. Here using the Earth system model of intermediate complexity we performed for the first time simulations of co-evolution of climate, ice sheets and carbon cycle using the astronomical forcing as the only external forcing.